After reading Cabot's latest, I borrowed this from the local library! The future stretches out in front of Sarah Dobbs like the pure blue Texas sky. Leaving the past behind in Philadelphia, mail-order bride Sarah arrives in San Antonio ready to greet her groom, Austin Canfield, a man she has never met but whose letters have won her heart from afar. But there is one problem--he has died. And Sarah cannot go back East. As Sarah tries to reconcile herself to a future that is drastically changed, Austin's brother, Clay, struggles with his own muddled plans. Though he dislikes working on the family ranch and longs for a different life, Clay is driven to avenge his brother's death. But something between them is growing and neither Clay nor Sarah is ready to admit it. Book 1 of the Texas Dreams series, Paper Roses will sweep readers into the Hill Country with a tale of love and loss, closed doors and beautiful possibilities that will leave them wanting more. 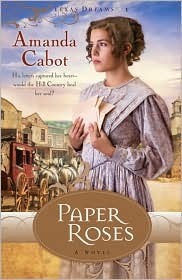 I borrowed 'Paper Roses' from the library after I read (and loved) Amanda Cabot's 2012 release 'Summer of Promise'. This story is set in Ladreville, Texas, and I was disappointed to learn that Ladreville was purely fictional. Being a historical detail reader at heart, this felt like a small cop-out, though I am sure many pure fiction readers wouldn't have noticed. I was hoping to learn a bit about the state of Texas, instead it is more of a general nuance that I could get from the story. With that negative out of the way, on to the next one. The story was predictable and slow paced. And with that out of the way, let me state for the record I did enjoy this story. The character of Sarah Dobbs is expertly written, with her flaws and her strengths, and the love interest of Clay was a typical stubborn man set in his ways. The faith aspect was a bit more evident here than I noticed in 'Summer of Promise', as both Sarah and Clay feel that God was cruel to have taken their loved ones away. It takes healing and kindness from others for the two to be able to abandon their hurt and open themselves to God. The plot line centers around Sarah running from a shunned life to a brand new adventure in Texas, yet her groom to be was murdered just before she got there. Clay is the groom's brother, set on the path of revenge and once that is done he also hopes to flee his life and move to Boston. Sarah and Clay respect each other but refuse to see how well they could be matched, although the reader knows from the start that there has to be something in the future for Sarah and Clay. Supporting characters are plenty, with the townsfolk of Ladreville and of Clay's household, with Sarah's little sister Thea following along. A strong theme was the dislike between the Germans and the French who make up the town of newly settled Ladreville, and there are thefts and a few deaths that start to peel away at the town's security. Clay and Sarah must team up to discover the truth behind the evil of the town, and in doing so, they also end up risking everything. There were some really intriguing plot lines that would satisfy those looking for a lazy historical romance and a bit of shady mystery, with a strong theme of redemption. I look forward to the rest of the trilogy, as some of the same characters of Ladreville will be revisited in 'Scattered Petals' (2010), and 'Tomorrow's Garden' (2011).